Another exciting offering Smart Communications is giving to it's valued Smart subscribers, the newest "Smart MEGA ALL-IN 250," that can promise you a CALL + SMS + Mobile Internet for only Php250 for a month. Smart MEGA ALL-IN 250 can give you unlimited texting to ALL networks such as Globe, TM, SUN, and TNT, plus 180 minutes of calls to (Smart, Sun and TNT), plus 100 MB worth of mobile internet for 30 days. How to Use and Register? Then you can now make call to (Smart, Sun and TNT) - dial *2477 + 11-digit cellphone number, if you like to call. 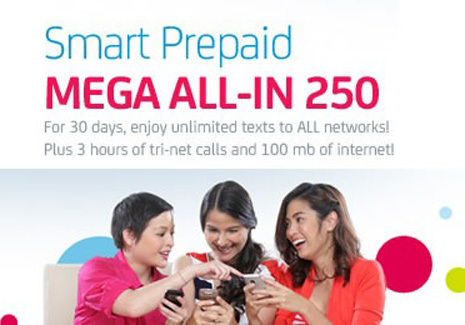 By the way, this Smart MEGA All-IN 250 is valid until November 15, 2012. Comments or suggestions about "Smart MEGA All-IN 250 for Smart Prepaid Subscribers" is important to us, you may share it by using the comment box below.